The conventionally perfect face shape is a perfectly proportioned oval. Few women have that perfect face shape, but through the careful choice of earrings, a woman can give the illusion of a slimmer or wider face, depending on the effect she wants. For example, a woman with a round face might want to use accessories and makeup to make her face looks slimmer, unless she is a model. Models thrive on their unique looks, so she might want to highlight the roundness of her face. A woman with a square face might want to soften the lines of her jaw, but if she views her face shape as an asset, she might want to emphasize the sharp angles of her face to stand out from the crowd. Creating the illusion of a slimmer face, or a wider one, of sharper features or softer features is easier than you might think. All you need are the right earrings. The earrings have to be large enough to frame the face in order to have the necessary result. Tiny ear studs wouldn’t cut it. Larger earrings that are clearly visible when people look directly at you are necessary to help create these illusions. If you have an oval face, you can wear literally any kind of earrings and look great. If not, you can use earrings to make your face appear oval. Let’s start with a thin, narrow face. What you need is something along the horizontal lines to give the illusion of width. Try a pair of round button earrings. From 70′s style plastic earrings to sophisticated diamond earrings in a large circular design to wooden ear clips would do fine. 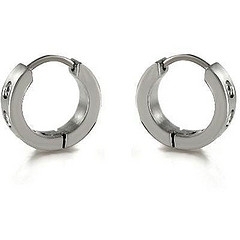 If you like hoops, wear huggies that are close to the ear and which are wide, to give the illusion of width. To soften too sharp features, go for earring designs with curves or which are rounded. Hoop earrings work very well as would earrings with round beads or with circles in the design, or even waves. To sharpen flat features, wear angular earrings. Triangles, stars and shapes that are pointed or with sharp lines would work very well. For a round face or square face, you’d want the illusion of length. A dangling pendant or a cascade of beads that draw the attention along vertical lines would visually slim and lengthen your face. Shoulder dusters are your best friend, as are drop earrings and chandelier earrings. This entry was posted in Glittering Diamonds and tagged 14k, diamond, earring,, gold, jewelry on August 26, 2009 by admin.